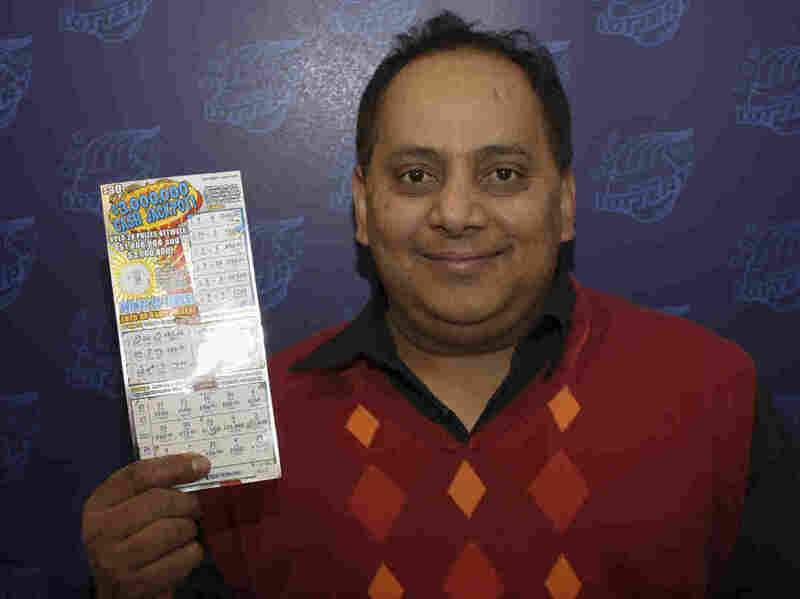 Body Exhumed Of Lottery Winner Who Suffered Cyanide-Related Death : The Two-Way Urooj Khan died one day after his $425,000 Illinois Lottery check was cut. It wasn't until much later, though, that authorities determined there was a lethal level of cyanide in his blood. Now, they're doing a full autopsy. And police are investigating his death. Urooj Khan, with his winning lottery ticket. Not long after this photo was taken, he was dead. The remains of Urooj Khan, the Chicago man who last July died one day after his $425,000 check from the Illinois lottery was cut, were exhumed today, the Chicago Tribune reports. Now, a full autopsy will be done to see if more can be learned about his death and whether he may have been murdered. Authorities have previously said they've determined there was a lethal amount of cyanide in Khan's blood system. "A pathologist will take samples of Khan's stomach contents to try to determine how the cyanide was ingested, Mary Paleologos, Cina's spokeswoman, has said. They will also look at other organs such as the lungs to make certain the cyanide wasn't inhaled, she said." The medical examiner's office initially ruled that the 46-year-old Khan had died of natural causes. No autopsy was performed. At that time, the medical examiner's office did not routinely do autopsies on those older than 45 unless the death was suspicious. The age cutoff has since been raised to 50. A few days after that initial ruling, though, a family member contacted the medical examiner's office and expressed concern about Khan's death. That led to tests on some of Khan's blood that had been stored. A lethal amount of cyanide was discovered. And now, Chicago police are investigating. Khan's relatives, by the way, have been arguing over who gets the money.